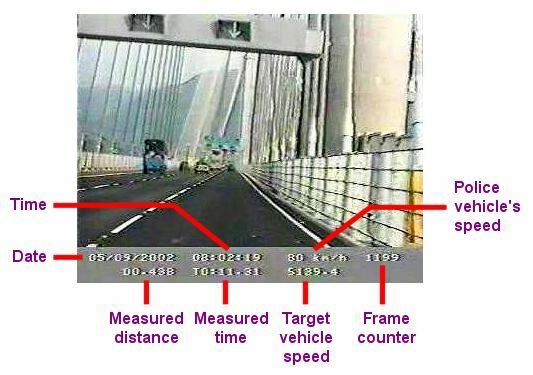 Below you can see what the display of the Vascar Autovision system looks like, and the information that's recorded on the traffic video. We can use this information to verify the accuracy of the speed reading in your case and this link explains how to get a copy of your traffic video. ACPO guidelines describe how the system should be operated. The following four frames show the equipment being used correctly in accordance with the the ACPO guidelines. 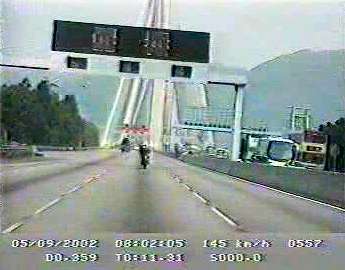 As the shadow strikes the motorcycle, the officer starts the time. 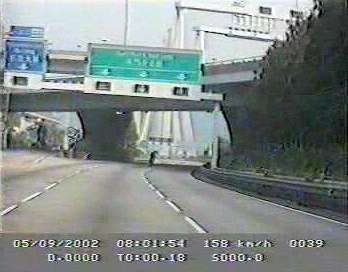 As the police vehicle reaches the point where the time was started, the officer starts the distance measurement. When the motorcycle reaches the second marker, the time is stopped. 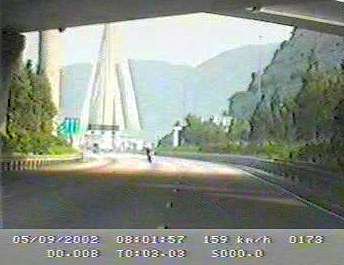 When the police vehicle reaches the second marker, the distance measurement is stopped and the target vehicle's average speed is calculated and displayed. 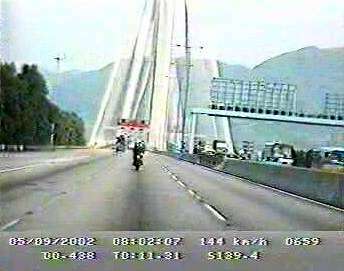 In true PePiPoo tradition, you can also download the traffic video (2.2 Mb) from this link, and we think that you will more impressed with the operation of the VASCAR system than with the traffic officer's driving! Can you guess where the traffic video was recorded? You will need a RealNetworks video player to play the free video extract - you can download a free player from their website.